I can only imagine the excitement that Roger Dunford must have felt when he climbed onto the Palace Pier in 1946, before it had reopened after years of dereliction during the Second World War. When he sat down between a large ‘C’ and ‘E’, things were really put into perspective. The moment was caught on camera and now takes pride of place in Brighton Fishing Museum (in a display that was, incidentally, built by my skilled friend Alex Briault). This footage, just one of many 16mm films that had been stored in Roger Dunford’s shed, forms part of a large project called Floating Memories that brings to life the archives of Brighton Swimming Club. A number of individuals were involved in getting Floating Memories off the ground including, in particular, graphic designer and club member Paul Farrington. Paul built on the work of David Sawyers who deposited the varied club archives with the Brighton Museum in 1995. Although the club records were safe at the museum, they were hardly accessible, which is what led to Paul applying for funding from the Heritage Lottery Fund to bring the archive to life. The bid was successful. The project includes a map/guide which focuses on the various swimming baths that have existed in both Brighton and Hove over the years. I was pleased at the mention of Hove Baths, which I know well, as I have campaigned hard for the last remaining piece of it, Medina House, to be retained. Sections on Awsiter’s Baths on Pool Valley, Mahomed’s Baths on King’s Road and Brill’s Baths on East Street, which I don’t know so well, are certainly worth a read. The ongoing project includes the cataloguing of boxes of archives of club history and the digitising of more reels of film. The physical records will end up in The Keep (the research centre that is currently being built near the University of Sussex). 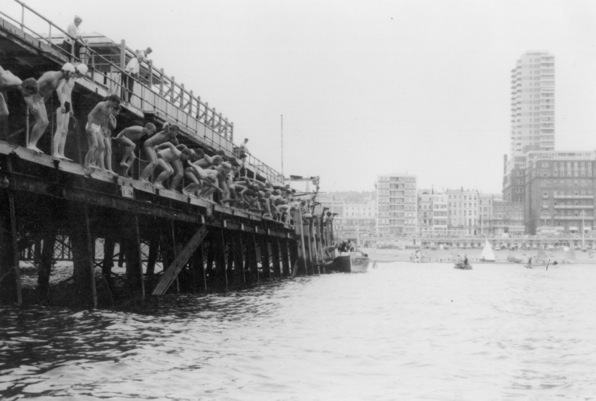 Other footage at Brighton Fishing Museum shows young male members larking around on the beach and in the sea in the queerest of bathing suits with their young ladies watching. One guy gets buried in stones and then soaked with water. Others are playing records. It is rather pertinent that Medina House was featured as it currently empty. 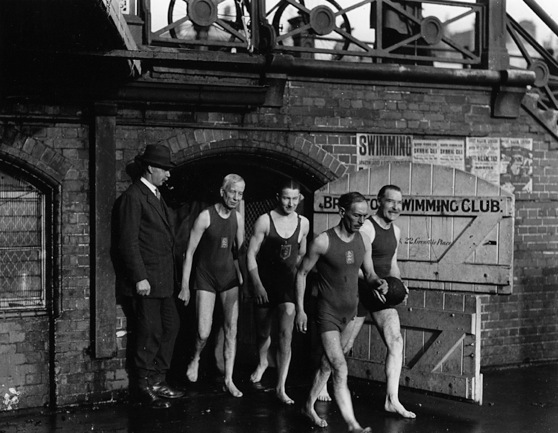 It would make a cracking museum – a swimming museum perhaps? See www.floatingmemories.co.uk and Brighton Visitor Centre by the Royal Pavilion for the map/guide. 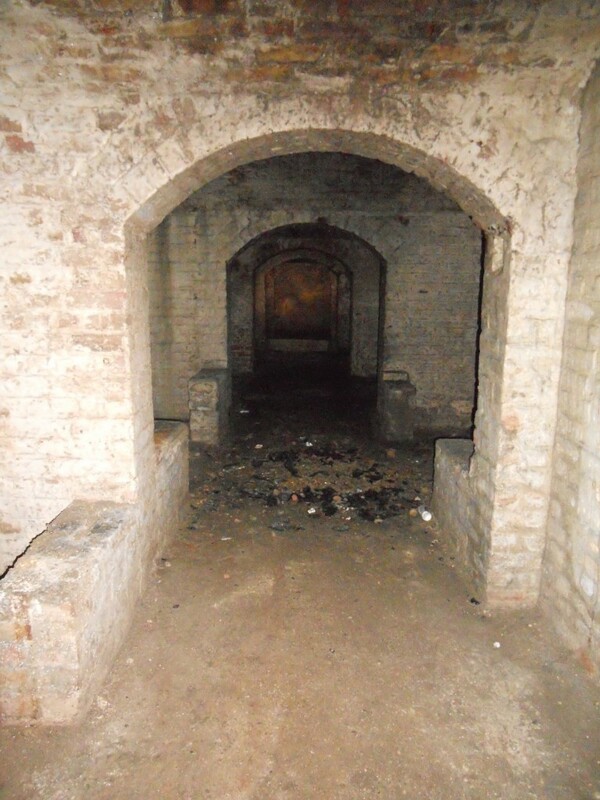 Vast cellars that may be accessed from Moss Bros on Church Road in Hove serve as a reminder of a most obtrusive brewery that once occupied the site. The imposing Brighton Steam Brewery was built in 1852 by George Gallard, one of the four men who developed the Cliftonville district of Hove. The brick-built structure consisted of three bays that faced Church Road and eight that faced Osborne Villas (or Osborne Street as that portion of the road was then called). A huge chimney dominated Osborne and a low protrusion, known as ‘The Bunion’ obstructed Church Road. The brewery was demolished in 1902 after extensive efforts by the Hove Commissioners. No doubt there were other reasons for the demolition other than the desire to remove the obstructive section that hindered users of Church Road. Two handsome four-storey red-brick Edwardian buildings replaced the brewery – commercial premises called Kingsway House (numbered today as 134-140 Church Road) and a residential block called Grosvenor Mansions (on Osborne Villas). Kingsway House has been vastly modified at street level (that’s all that most people look at anyway) by the addition of a canopy. Grosvenor Mansions is fortunately unchanged. Many different shops have occupied Kingsway House over the years. In 1904-10, the corner unit was occupied by a stationery firm called Carter Bros. Many remember Cobleys, the tailors that occupied all four of the shop units until Moss Bros took over in 1981. It was Kevin Baldock, the enterprising store manager of Moss Bros, who got in touch about the extensive remain of the brewery’s cellars. These dark vaulted rooms are reached via five steps that lead down from the very end of the Moss Bros basement. The derelict area is actually below Grosvenor Mansions and the Osborne Villas pavement. There are several sections and the best bit, which is pitch black, consists of six vaulted chambers where perhaps barrels were once stored. 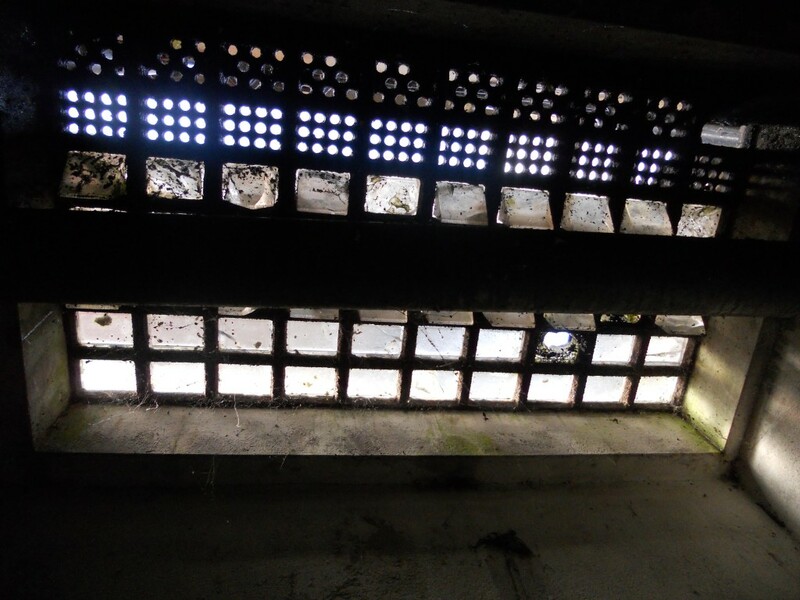 Each offers a different clue, such as bricked-up coal holes, as to what exists above. The biggest giveaway is the loud footsteps of pedestrians. My friend Patsy Perrousset, who lived above Cobleys during the 1940s and 50s, recalls the cellars well. Although they were used as an air raid shelter during the Second World War, Patsy remembers being instructed to shelter beneath the stairs in Kingsway House, rather than the cellars. This makes sense. I would not wish to get trapped down there either. When Brighton Council bought the Stanmer estate from the Pelham family in 1947 for £225,000, I wonder to what degree the future of this great wooded park was predicted. I certainly did not predict that seven new houses, which are now close to completion, would be built at the rear of Stanmer House. In 1954, Stanmer House was made a Grade I listed building and the nearby stables were made Grade II*. This was before Sir Basil Spence’s architecturally-admired and -hated Sussex University was even built. The university’s Falmer House was made Grade I in 1993 and is surrounded by a myriad of Grade II* structures. The breathtaking-once-discovered Earthship Brighton has won many awards since it was built in 2005 including Greenest Building in Sussex. The surrounding Stanmer Park falls within the South Downs National Park that was created in 2009. 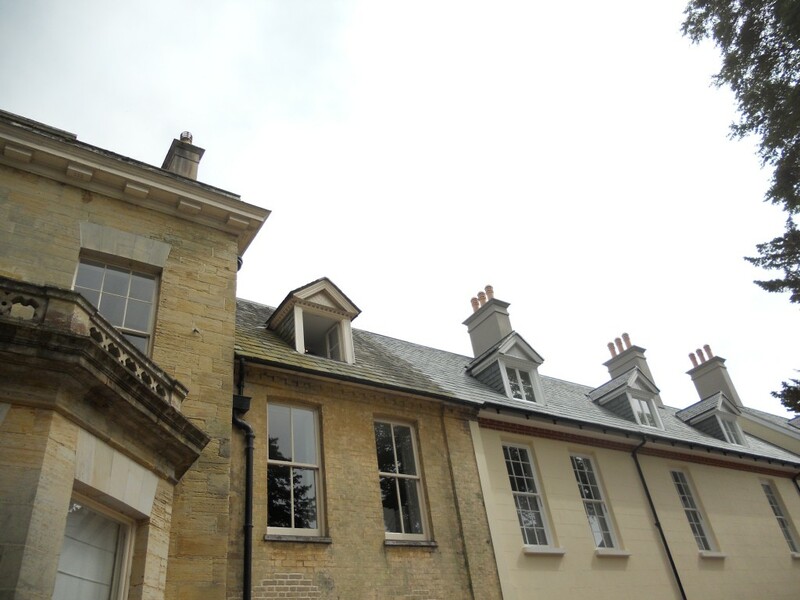 Although the architectural styles of the buildings on the Stanmer estate are a real mix, there is no doubt that anything new must sit amongst buildings of the highest quality imaginable in the most protected of natural areas. The council granted a 125-year lease of Stanmer House to local businessman Mike Holland in 2009 without a premium on the condition that he spend millions restoring it, which he has done impeccably well. The house had been rotting for years and, pertinent to this story, its north and west wings had actually been demolished in 1961. These were the servants’ quarters and colonnade respectively. 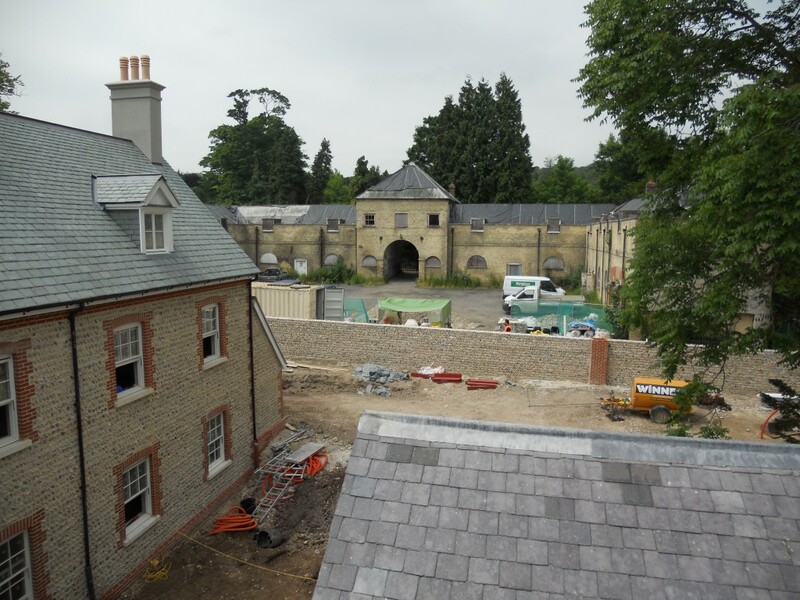 The new houses have actually been built on the footprint of the old north wing but, at prices ranging from £795,000 to £975,000, they might be slightly out of the reach of a typical servant. The scheme’s original planning application was submitted in 2004 and permission was not granted until 2009. Various external finishes have been used including render, and flint with red-brick quoins. Several details are questionable including chimneys which are really just there for show. I came to view the houses through Hove-based architectural practice ABIR which, whilst not responsible for the original application, has guided the scheme through planning and construction – and a fine job they are doing too. I am still juggling in mind the general principle of adding houses onto the back of a stately home. I will reserve judgment until these houses, and the homes that are to be created within the nearby stables, are all sold off and occupied. “It is regrettable that the opportunity was not taken to retain a part of the Brighton Locomotive Works as a museum of steam…” wrote Ken Fines in A History of Brighton & Hove. Perhaps all is not lost in that regard. I have been shown around some quite unbelievable subterranean spaces in the seven years that I have been writing this column. The vast cellars beneath the Houses of Parliament or the new sewer tunnel from Brighton to Peacehaven will take some beating. But most impressive of all are three separate hidden areas underneath Brighton Station that I have just seen. Some readers may well remember the toilets below the southernmost section of Brighton Station. These were closed in recent years, and the corresponding opening onto Trafalgar Street some time before that. Some recall the area as being grotty but, in its preserved dusty state, it looks nothing of the sort. 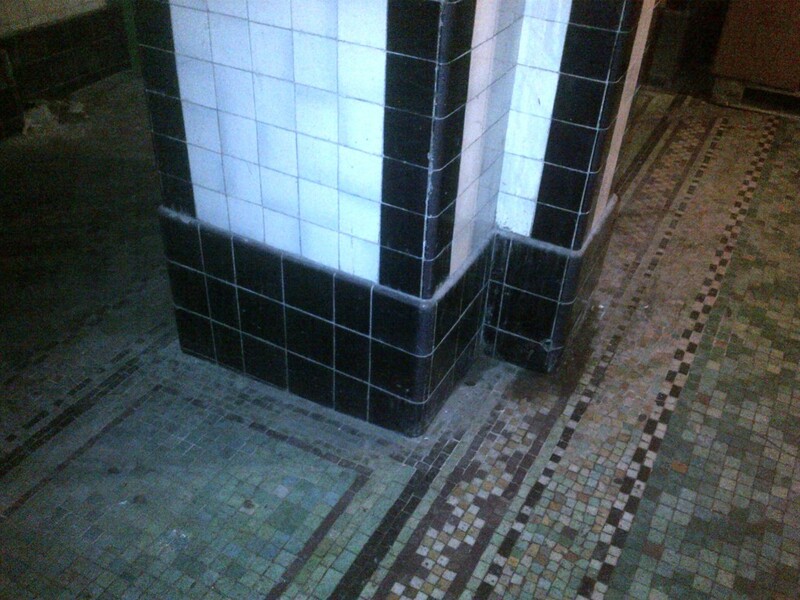 Its mosaic floor tiles would not look out of place in Brighton Town Hall or even the Victoria & Albert Museum. Everything is still down there, including a derelict barbershop. Entirely separate to the toilet area is a vast tunnel that runs underneath the easternmost portion of the building from Trafalgar Street to, after a 180˚ turn, Brighton Station’s internal road between platforms 7 and 8. The tunnel was built as an access road for horse-drawn carriages and was originally open to the elements. Its exit is currently covered by a storage area. 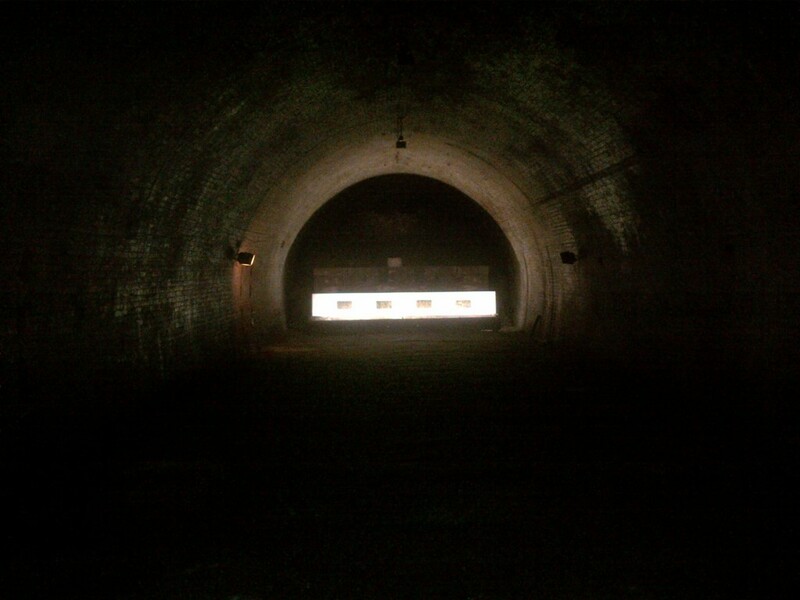 The grand finale was an extraordinarily spacious tunnel that runs, approximately, west-east beneath the whole station. It once allowed trains from Shoreham to run underneath the other lines, to the lower good yards below. It currently serves as a firing range. Local historian Jackie Marsh-Hobbs, who runs tours of the secret areas, kindly explained its original purpose to me. There is so much to discuss and investigate down there. No doubt elf & safety is cited, or ‘security’ (yawn), for the complete lack of progress in making proper use of any of these unknown caverns. My suggestion for a worthy use would be a whole new transport museum that would work alongside the adjacent Toy & Model Museum but run in a similar manner to Brighton Town Hall’s Old Police Cells Museum. There are many potential uses though. Somebody please pick just one. Thank you to Simon and Julie at Brighton Station for the wonderful tour.